Lessons gathered from experience with using Minecraft and other games to boost engagement and meet learning objectives. If you’ve ever caught yourself spending hours sorting digital playing cards, trying to avoid mines, or exploding pieces of candy on a screen, you know just how engaging digital games can be. When used in educational settings, digital games have the power to immerse students in a rich learning environment. Minecraft is one such game used by educators from kindergarten to higher education. It drops the player into an infinitely customizable world of blocks, animals, and monsters where players (and teachers) can set their own goals. And many students already play this game, which means teachers have the opportunity to transfer students’ skills into an academic context. When I tell people I use Minecraft to teach high school English, I am most often met with incredulity: How is this possible? I explain that students can play through survival scenarios to create narratives, re-create settings and scenes from novels to demonstrate reading comprehension, and even analyze the digital game itself as a new media genre. 1. Let students be the experts in the gameplay while you facilitate the learning experiences: Introducing video games like Minecraft disrupts the hierarchical model of teaching because students often know more about the medium than their teachers. Instead of worrying about this, let the students collaborate by teaching each other and researching the game mechanics—the unique rules and features of a game. The classroom learning becomes reciprocal as the teacher designs learning experiences while the students teach the teacher more about the game. 2. Let it be a game, not a worksheet in disguise: Students are quick to pick up on activities that seem enjoyable on the surface but are no deeper than a worksheet. But teachers can use gameplay to achieve learning goals, by allowing students to play the game as the game is intended to be played while structuring the experience in a way that demonstrates learning goals. For example, students who are charged with building a scene from a book in Minecraft might have to work together to collect the stone, wood, wool, and glass. Along the way, they’ll most likely take the initiative to go out into the online Minecraft community to research how to shear sheep or the fastest method of cutting down trees. While meeting the sole learning goal related to reading comprehension and imagery, the students have added to their research, critical thinking, and problem solving skills. 3. 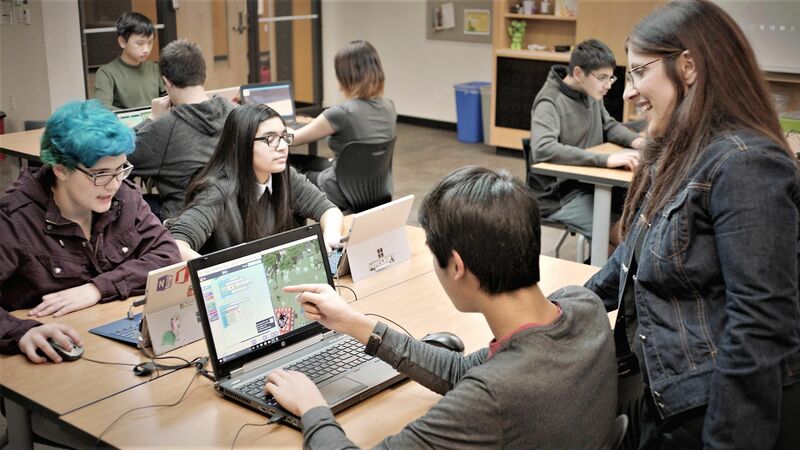 Embrace problems and challenge students to solve them: Digital games have the potential to introduce problems with technology and even behavior during the lesson. Fortunately, the standard premise of every game is that there is a problem that must be overcome, and it is up to the players to use their resources to overcome that obstacle. Likewise, teachers should make students the central players in any problems that arise. If the internet goes out or a student’s laptop will not function, encourage the students to try to find solutions and work-arounds, like creating a mobile hotspot, moving to a different location, playing the game offline, or even playing the game in real life using manipulatives or by acting out parts. These complications have the potential to be valuable opportunities to create a classroom culture of active learning and problem solving. 4. Play the game first and then learn the teacher controls: Some games have an educational version that allows teachers to customize and control the learning environment. These versions may also include data tools, the ability to move players around in the game, and the option to modify the game’s difficulty. However, I suggest that you start by just playing the game. The goal here is not to become a master of the game but to have fun while researching its potential for your classroom. As I play Minecraft and explore new games, I focus on matching the reasons I’m having fun with the learning objectives each challenge in the game can meet. The constitution encourages accountability because the students develop consequences for times when they break rules that they have set up for themselves. If two students are off-task and disrupting the learning of their peers, for example, they may be kicked out of the game for a certain period of time, or perhaps have extra constraints within the game that limit their ability to be off-task. Digital games have the potential to infuse your classroom with fun while students demonstrate learning goal after learning goal. As with any new pedagogical strategy, there is a learning curve, but the payoff is worth it. Game-based learning has the potential to break up a dull routine, infuse your classroom with energy, and generate student interest.